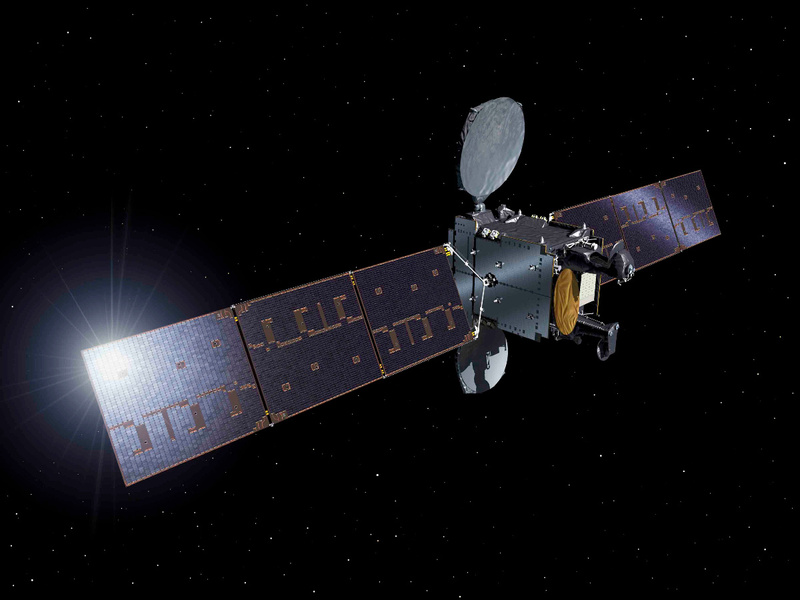 Hispasat 36W-1, previously known as Hispasat AG1, is a commercial communications satellite operated by Spanish Telecommunications Provider Hispasat to deliver communications services to continental Europe, the Canary Islands and South America. It is the first satellite based on the SmallGEO (LUXOR) Satellite Platform developed by OHB Systems with support from ESA. The SmallGEO program has the overall goal of developing a small, multi-mission geostationary satellite platform that will enable European industry to compete in the commercial telecommunications market for small satellite platforms. Development was initiated under ESA’s ARTES Initiative – Advanced Research in Telecommunications Systems. The SmallGEO satellite platform has been designed to permit short integration times and employ a highly modular structure to be able to cater the satellites to their respective mission needs and also allow the program to respond swiftly to new market demands in a cost-efficient way. High-reliability of the satellite bus is ensured through a reduction of complexity and the use of proven subsystem components. SmallGEO has been optimized for application in communications, but the modular design allows the bus to be configured for Earth-observation and meteorology missions. The SmallGEO platform employs state of the art power generation and storage systems, highly precise three-axis stabilization is provided by accurate attitude determination systems and actuators. The platform can be fitted with a chemical propulsion system, hybrid systems and full-electric propulsion, allowing the satellites to enjoy extended missions if hybrid or fully electric options are chosen. SmallGEO satellites, depending on the propellant and payload configuration, have a launch mass between 2,500 and 3,500 Kilograms with a payload mass of up to 900 Kilograms. 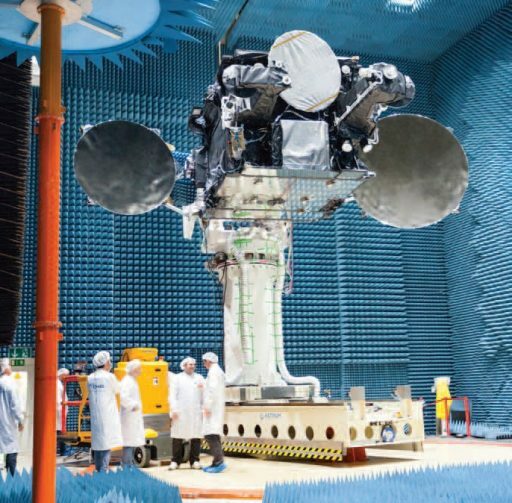 The satellite platform has been designed for a 15-year service life and is compatible with a wide array of launch vehicles including Ariane 5/6, Soyuz, Proton, Atlas V and Falcon 9. The FAST Configuration (classical propulsion system or hybrid configuration) weighs up to 3,500 Kilograms at launch and supports a payload of 450 Kilograms with a nominal payload power of 5 Kilowatts, provided by a pair of three-panel solar arrays. FAST has been baselined for 32 transponders that can cover the full spectrum of frequencies from L to Ka-Band as well as optical laser communications. 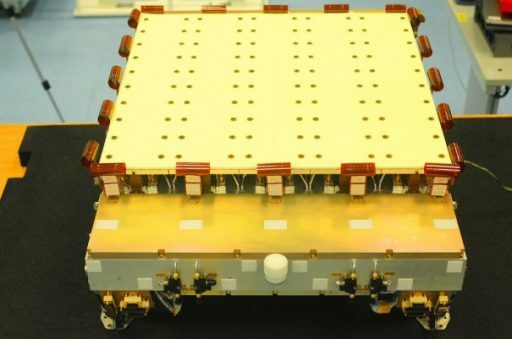 FLEX, the full-electric satellite configuration, has been designed for maximum efficiency, permitting a payload of up to 60 transponders and 900 Kilograms with an end-of-life power of 10 Kilowatts, generated by larger, five-panel solar arrays. The FLEX configuration, while also designed for a 15-year life, will have sufficient propellant to support a 20-year mission. A third SmallGEO configuration is primarily for Earth Observation missions, designed to have a launch mass of 3,800kg with a classical bi-propellant propulsion system and a 650-Kilogram payload. Because meteorological payloads require less power, the EO configuration flies with only two solar array panels, delivering 1,350 Watts to the payload. At present (early 2017) a total of eight SmallGEO satellites have been ordered from OHB Systems, the first was Hispasat 36W-1 in 2008. 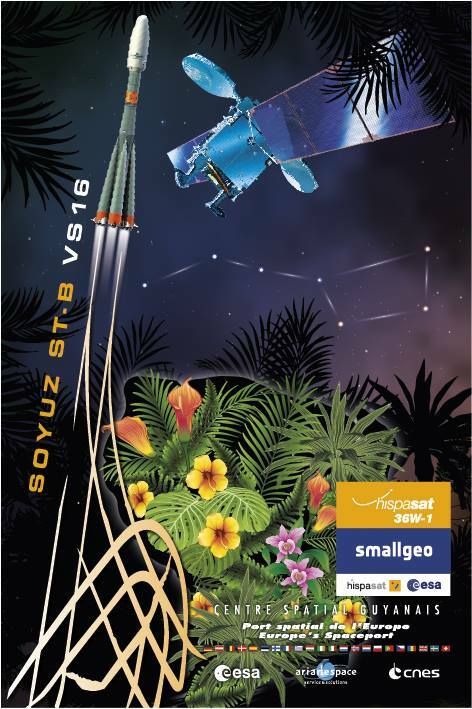 Also flying on SmallGEO is the European Data Relay Satellite C and the third generation of Europe’s Meteosat weather satellites with a total of six spacecraft planned to launch between 2019 and 2031. The first SmallGEO satellite was built under a Public-Private Partnership between ESA, OHB and Hispasat with a number of partners in the European space sector providing system components. The Hispasat 36W-1 satellite will serve two important purposes, a) validate the SmallGEO platform in an operational environment and b) deliver media services as part of Hispasat’s satellite fleet which currently caries more than 1,250 TV and radio channels to households in Europe and Latin America. 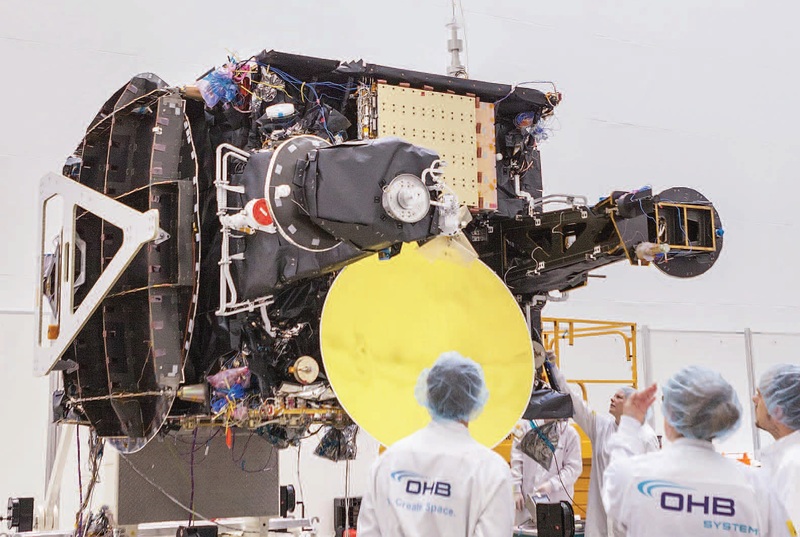 Hispasat 36W-1 has a dry mass of 1,700 Kilograms and holds approximately 1.5 metric tons of propellant at liftoff for a total launch mass of 3,220 Kilograms. 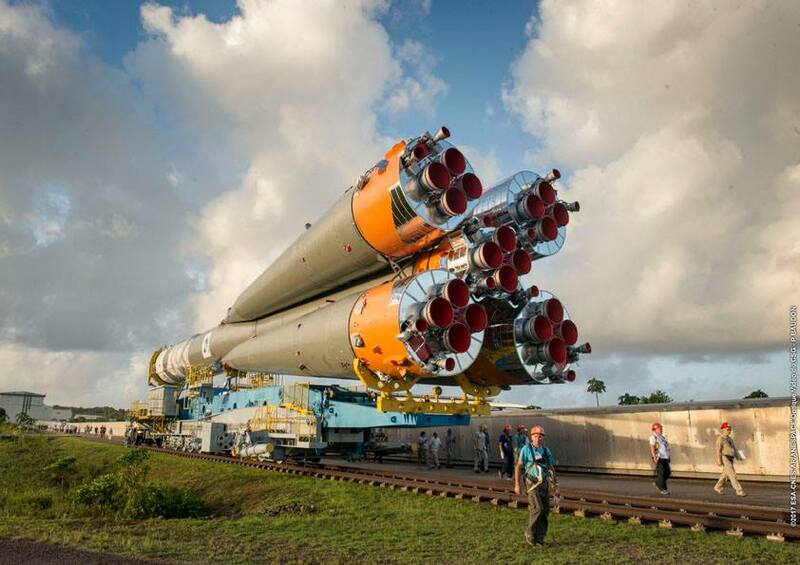 When in its stowed configuration, the satellite measures 3.1 by 2.47 by 4.95 meters in size, growing to 7.5 by 20.8 by 4.95 meters once deploying its communication antenna reflectors and solar arrays. The satellite generates over 6 Kilowatts of electrical power, 3.4kW will be available to the satellite payload at the end of the 15-year mission. The satellite’s communications payload consists of 20 transponders in Ku-Band operating at 33 and 36 MHz bandwidths with two dedicated reflector antennas. Additional capacity is provided by three 144MHz Ka-Band transponders that have their own dedicated Ka-Band reflector antenna. 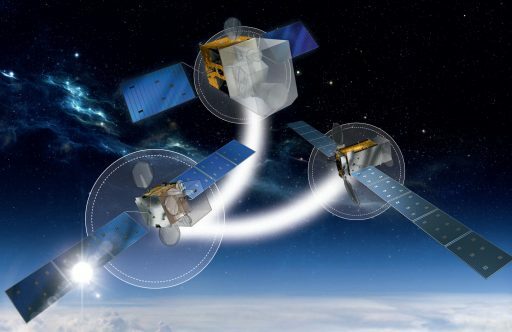 A fourth reception active reconfigurable antenna is dedicated to the RedSAT payload, an innovative communications system developed by Thales Alenia to deliver high-capacity multimedia and broadband Internet services. RedSAT employs an active Direct Radiating Array (DRA) providing four reconfigurable Ku-Band uplink beams (receive) and a new type of onboard processor to condition four regenerative channels of 36 MHz. This type of technology will enable a more agile and efficient use of power and increase the transmission capacity via active reconfiguration of communication beams through an Electronically Steerable Antenna. Electronically Steerable Antennas allow for active beam shaping, generating spot, shaped and steerable beams, and even supporting beam hopping between a set of pre-defined directions. These options can be implemented independently for each beam or simultaneously for all four. The second critical component of RedSAT is the Onboard Processor (OBP) which processes all four RedSAT channels at once and converts uplink data received in the DVB-RCS standard to the newer Digital Video Broadcasting Second Generation DVB-S2 standard. The processor system comprises three major components, a pair of L-Band processor units, a Ku/L down/up converter and a set of filters and flight harness equipment. The OBP simultaneously processes all four RedSAT channels, completing demultiplexing, demodulation and decoding of the received RCS uplinks and then re-multiplexes the received data in order to condition four DVB-S2 downlink Transport Data Mechanisms (TDM). OBP handles traffic according to a reconfigurable QoS algorithm (best effort, high priority, jitter sensitive traffic). 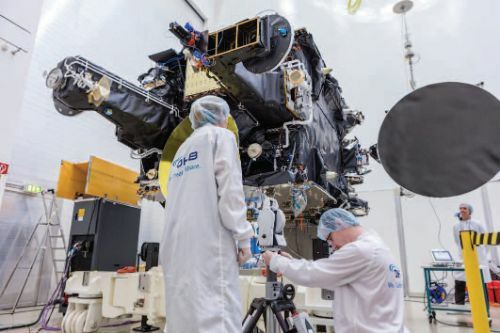 Hispasat 36W-1 will operate from a Geostationary Position at 36 degrees West, located over the Atlantic Ocean from where the satellite can provide services in Hispasat’s European and American markets. The satellite will deliver multimedia capacity to the Iberian Peninsula, the Canary Islands and South America.